Marine Sergeant Anthony McDaniel was four months into his second deployment when he lost both of his legs and his left hand when he stepped on an improvised explosive device (IED) in Kajaki, Afghanistan on Aug. 31, 2010. While on a route clearance patrol with the 3rd Battalion, 12th Marines, Sgt McDaniel stepped on an IED resulting in the traumatic amputations of his legs, and his left hand at the wrist. Lifesaving measures prepared Anthony for a medical evacuation by helicopter. Treated at Camp Bastion in Afghanistan, he was stabilized for transport to Landstuhl, Germany. Sgt McDaniel initially was treated at Bethesda National Medical Center before being transferred to Walter Reed Medical Center where he remained for five months. Now medically retired, Sgt McDaniel enjoys spending time with his children and family and is active in his church. 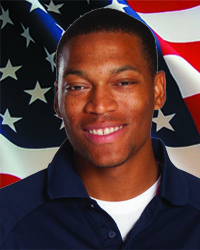 He enjoys wheelchair basketball and wheelchair racing, and has aspirations to compete as a member of the U. S. Paralympic Track Team. He has earned 12 gold and three silver medals in track and field events at the annual Warrior Games, medalling three straight years from 2012-2014. Anthony would like to become a music producer and says owning a home adapted to his injuries will give him the space and time for working on music.